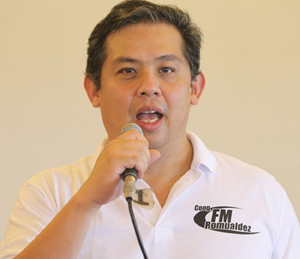 TACLOBAN CITY — House Independent Minority leader and Leyte 1st district Rep. Ferdinand Martin Romualdez yesterday expressed his gratitude and appreciation to all local and foreign donors who have helped the victims of super typhoon Yolanda. The world remembers today the first anniversary of super typhoon Yolanda, which wreaked havoc in Eastern Visayas, especially in this city, where about 3,000 were killed and billions of pesos worth of properties were damaged. Romualdez urged the government to continue the rehabilitation and recovery program in the calamity-stricken areas. “It has officially been a year after Yolanda. On behalf of the whole province of Leyte, we say thank you for the overwhelming support extended to us in our most desperate time of need,” Romualdez said. “We saw the outpouring of support not only from the international community but from private citizens as well. Aside from the innumerable food and medical supplies donated to the relief effort, we cannot quantify the countless hours people spent volunteering, rescuing, and providing relief to the affected communities,” he added. Romualdez, also president of the Philippine Constitution Association (Philconsa), urged the concerned government agencies and the people to continue working to help survivors and improve the typhoon-hit areas. “We know that the work is far from over. A year after Yolanda, the effort to rebuild Leyte continues so let’s keep moving, trabaho lang,” Romualdez stressed. “Reconstruction and disaster preparedness are main priorities now. These commemorative activities serve as a good reminder that the work continues a year after Yolanda, and that everyone can contribute to this massive effort to get Leyte back on its feet,” he said. The solon then announced the series of commemorative activities in Tacloban today. Awarding of livelihood projects will be led by the city government and Romualdez. Both public and private groups came together to organize the two-day event that began yesterday, echoing the cooperation and togetherness the country saw in the wake of the disaster. The Philippine Red Cross organized “Light the Darkness,” a commemorative run which started in Tolosa and ended at the PRC-Leyte Compound. A tree-planting activity was organized by the PhilHealth’s Region 8 unit, while the city government of Tacloban will hold memorial services for the victims of the disaster, which include a candle-lighting ceremony, offering of flowers and blessing of mass graves. Various arts and music events, film-showing, and health and fitness activities were held and organized by socio-civic organizations such as the Rotary Club of San Juanico, One Tacloban, and Alpha Phi Omega fraternity, alongside private groups, including ABS-CBN, GAPlabs, Inc and Wellside PTY. The World Health Organization also joined in with a collaborative artwork activity at the City Hall grounds. The European Union (EU) and its member States continue to extend assistance in an effort to rehabilitate the communities affected by Yolanda. The humanitarian assistance and early recovery interventions provided by the EU institutions to Yolanda survivors amounts to P2.5 billion, while the overall EU’s humanitarian assistance for Yolanda, including the funding coming from the member states, amounts to P28.5 billion. The Catholic Church has rolled out as much as P563 million in the relief, rehabilitation, and recovery of over two million individuals directly affected by Yolanda in Nov. 2013. Fr. Edu Gariguez, executive secretary of the Catholic Bishops’ Conference of the Philippines – National Secretariat for Social Action, Justice, and Peace, said the amount, mostly donations from 41 various Caritas International member-organizations in six continents, makes up the total budget of the Church’s humanitarian arm for typhoon Yolanda recovery.